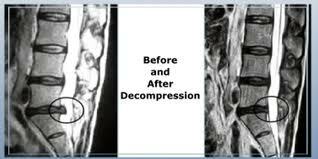 Healthy Life Chiropractic is proud to offer non-surgical spinal decompression to its patients. Spinal decompression is not a new concept. 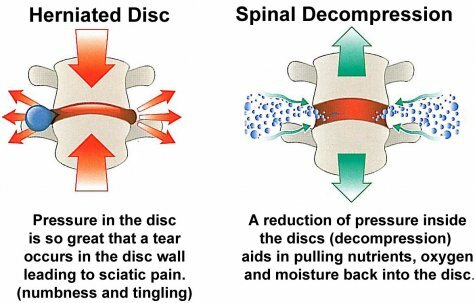 Rather, spinal decompression takes manual or mechanical traction a step forward by using computer technology to control treatment duration, distraction/angle, intensity, and relaxation. Spinal decompression works by gently stretching the spine. This changes the force and position of the spine. This will take pressure off the spinal discs, which are gel-like cushions between the bones in your spine. During a pull, a suction or vacuum effect draws in oxygen and nutrients into the discs necessary to stimulate healing. Notice the x-ray on the left, showing a herniated/bulging disc. The x-ray on the right is of the same spine after non-surgical spinal decompression therapy. Proponents of this treatment say that over time, negative pressure from this therapy may cause bulging or herniated discs to retract. That can take pressure off the nerves and other structures in your spine. This in turn, helps promote movement of water, oxygen, and nutrient-rich fluids into the discs so they can heal.